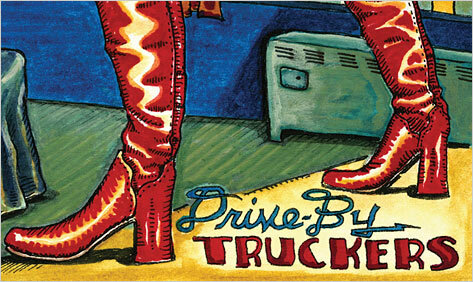 Go-Go Boots is the Drive-By Truckers’12th album and not their best. Before I attended its two-hour christening atthe Bowery Ballroom on February 15th, I wasn’t sure it was worth a column. Nordid the show itself convert me, though I enjoyed it even more than any of thefour other excellent DBT gigs I’d caught at steadily enlarging venues since2003. Instead, it demonstrated that conversion experiences weren’t the pointwith this band. The Drive-By Truckers don’t do transcendence. They dopersistence. They do body-of-work. The Drive-By Truckers aren’t bigger than Jesus. Theyaren’t even bigger than Kings of Leon, or Jesus’Son. But body-of-work-wise, they deserve to be. Between their threeguitars, their region of origin, and their career-making, LynyrdSkynyrd-inspired 2001 double-CD SouthernRock Opera, they’re slotted as Southernrock themselves. But beyond accents and generalized guitar noise they don’tsound much like the Allman Brothers, virtuosos down to their two drum kits, orSkynyrd, who boogied just as irrepressibly without playing half as good, or forthat matter Kings of Leon, who, beneath their Pentecostal backstory, are ahooky pop-rock band with a drawl. The DBTs do favor the trad chords andsongforms that are fast disappearing from intellectually respectable”rock.” But they’re cruder and less funky than the Southern rock ofyore, down with punk, grunge, and garage—all the better to set up thearticulation of the voices up front, and to add heft, breath, and entertainmentvalue to the words those voices sing. A dozen albums in, that’s a lot of words—almost 200songs including the two Hood solo jobs. These are not lapidary gems in theBrill Building/Music Row manner. Hood is generally a storyteller, while Cooley favorsa more formally conventional lyrical-philosophical-allusive mode. But thoughall quality songwriters master brevity, neither can be called terse. Tot up thelyrics in their gorgeous booklets—Virginia-based Wes Freed does all their coverart and illustrates inside too, sometimes down to individual tracks—and you’llfind many stanzas that exceed the 80-word limit pop gatekeepers impose on wholesongs. Not only is this a body of work, it’s suitable for a PhD thesis, severalof which I bet are in progress, because like no other Southern rock band, theDrive-By Truckers document the South. Not the whole South, granted—the whiteSouth, though they have no use for those they forthrightly label”racist.” But that’s plenty. The roughly similar Hold Steady locatemost of their narratives in a world of barflies and aging rock kids. TheDrive-Bys left that scene behind years ago. All strugglers are their province. The odd album out was 2006’s A Blessing and a Curse, undertaken after the DBTsfollowed Southern Rock Opera and Decoration Day with 2004’s excellent ifslower The Dirty South and still couldn’t pay theirbills. So they set themselves to squeezing 11 songs into 43 minutes withouttelling a tale or mentioning a Southern place, although Cooley cheated with”Space City”—which along with the Hood sermon “A World ofHurt” outshines everything else on a project whose blessings were scant,with Isbell quitting after it was done. But that still leaves a whole load ofsongs about the South, and if plenty of these are about the rock life itself,that life isn’t always their own: SouthernRock Opera is about Skynyrd first and a memoiristic DBT second, and latercame Carl Perkins (sad), George Jones (jocular), and the matched junkies ofCanadian Dixie-roots figureheads the Band, “Danko/Manuel” (funereal).Anyway, other themes have proven just as durable. The Drive-By Truckers have always spoken up for theunderdog louder than most bands. But though they’ve shown a grasp of the purelyeconomic since Cooley’s 1999 “Uncle Frank,” about an illiteratesmallholder driven to suicide by a TVA land grab, most of their earlysympathies wound up with a typical rock and roll assortment of stunt riders andsubstance abusers, which augmented by their colder-than-Nashville eye forconnubial gloom gave them plenty of hard-ups to sing about. As Hood and Cooleyfound fans, however, they grew more responsible and more tender. On Decoration Day, for instance, Hood’s”My Sweet Annette,” in which Annette gets left at the altar back in1933, and “Your Daddy Hates Me,” which doesn’t stop Hood from lovingher daddy, aren’t happy songs, but they aren’t merely “dark” either,and Cooley’s “Sounds Better in the Song” sees through the musicalwanderer who brags, “Lord knows, I can’t change.” The Dirty South didn’t derail thistrend—”Puttin’ People on the Moon,” about cancer in a factory towngone to rust, epitomizes it. But it did indulge their more cinematic ambitions,including several songs from an abortive Hood project about organized crime. Thencame the Isbell split—which all parties are polite about, although for sureIsbell is headstrong, and for sure the memorable songs on his two solo albumsdeserve livelier company than those other ones. And then, after a payday tourwith the Black Crowes, came 2008’s transcendent Brighter Than Creation’s Dark. Most DBT fanatics swear by Southern Rock Opera and Decoration Day, and so do I. But it was Brighter Than Creation’s Dark that mademe a fanatic too. With Neff’s steel keening away, it’s their most countryalbum, but there’s a soulfulness init when Shonna Tucker steps to the mic, and crucial keyboard colors fromlegendary white-soul songwriter-sideman Spooner Oldham, who worked withPatterson’s bass-playing dad David Hood in the heyday of Muscle Shoals. Hood’svocals are subtler, more thoughtful than vehement, and superior melodist Cooleychips in seven tunes less sardonic than a norm in which even one called”Marry Me” leaves you wondering what the catch is—like”Bob,” a fond look at the local gay guy and/or oddball, and”Lisa’s Birthday,” honoring a party girl who turns 21 several times ayear. Hood’s topics include a husband’s drink, a husband’s meth, a husband’spre-emptive suicide, a husband remembering his family from heaven, GI shootsIraqi, GI’s wife can’t sleep, opening acts, the cinematography of John Ford,and, my favorite because nothing “happens,” the tone-establishing”The Righteous Path,” which begins “I got a brand new car thatdrinks a bunch of gas/I got a house in a neighborhood that’s fading fast”and heads downhill without crashing. Yet. In an unusually meaty rock-doc shot five years ago butreleased on DVD simultaneously with Go GoBoots, Barr Weissman’s The Secret toa Happy Ending, Temple University historianBryant Simon calls the Drive-Bys “a very political band. They write aboutclass all the time.” This kind of perspective is both unheard of and thenub, because it extends the explicit class animus and secular skepticism ofCooley’s “Uncle Frank,” Hood’s “Sink Hole,” and Isbell’s”The Day John Henry Died” to the sullen desperation of the band’sdomestic dramas and low-life blowouts. BrighterThan Creation’s Dark takes the opposite tack. Hood’s laid-back mood,Cooley’s kind calm, and Tucker’s female principle jell around “TheRighteous Path” until it feels like an album about—to take a few of Hood’swords out of context—”the good things, and that’s much, much harder.”I was disappointed to learn recently that the husband-in-heaven “TwoDaughters and a Beautiful Wife” was inspired not by the premature death ofa fictional dad but by the spree killing of an entire real-life family—a familyHood, who carries a trouble magnet in his jeans, knew personally. I’d muchrather he write human interest stories than TV treatments. Loving an album the way I love Brighter Than Creation’s Dark can spoil ordinary pleasures, and soI failed to fully appreciate The BigTo-Do in 2010, though Lord knows Itried. Go-Go Boots I’m more objectiveabout—solid record, no Decoration Day.Both are the good work of a great band who resemble Tom Petty’s Heartbreakersmore than they used to—new pianist Jay Gonzalez is a Benmont Tench type ratherthan a Spooner Oldham type, which as avowed Petty fans the other guys knewcoming in. But that’s a detail. There are those who prize the Drive-Bys’ musicper se—they cut a Muscle Shoals album with late-breaking soul diva BettyeLaVette and won a 2010 Grammy for the instrumental Booker T. collab Potato Hole. And I like them fine as aband—at the Bowery Ballroom Cooley’s solos riveted, and when Neff picked up aGibson they were Skynyrd enough for Neil Young himself. But theiroverwhelmingly male audience adores them for a songbook with few equals, andtopping Brighter Than Creation’s Darkstraight away was, simply put, impossible. So the next two were merely mortal,and although I wish the title song of Go-GoBoots, in which an evil preacher hires hit men to off his wife (and there’smore), was more John Ford and less TheGlades, I’ll make do and then some with Shonna’s soul and Cooley’sready-steady and the Eddie Hinton covers and the cop-vet pairing. I don’t use my shuffle functionmuch because I still subscribe to the belief that albums signify as such. Butwith this body of work I decided to stick five lesser CDs in the changer andfind out what happened. Of course, songs entered my cerebellum afresh—the old”Zoloft,” pretty juvenile (as they knew); the new “The WeakestMan,” pretty pathetic (as he knew). But most of all the Drive-By Truckers’music per se revealed itself from PizzaDeliverance, back when they were notional gangstabillies flipping the birdat the cheap all-American-ness of the New South, to Go-Go Boots, in which they surely hope reside residuals sufficientto cover their Koch-targeted healthcare costs and kids’ educations. By no meansis it one seamless thing—guitars that once twanged and abraded now boom andenvelop, and the unembellished beat has muscled up. But what’s most striking ishow the voices provide sound as well as meaning. Like many lesser singers, Hoodand Cooley resist description. Hood isn’t near pretty and switches sandpapergrades regularly, yet he’s sweet a lot and thoughtful more and more, and attimes his drawl can seem as universal as a ’60s Brit’s. Cooley is moreunreconstructed, with a depth that suggests George Jones admiring LeftyFrizzell’s flow and the diffidence of a fella who’ll crack one hell of a joke15 seconds after that stranger leaves the room. Except to add “So’s Cooley’s,” let’s leave itthere.